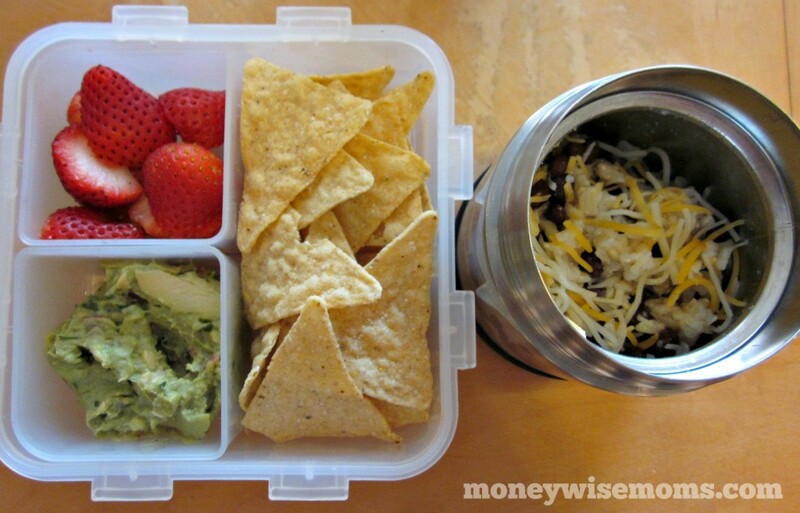 Disclosure: This post contains affiliate links to our favorite lunchbox packing products. 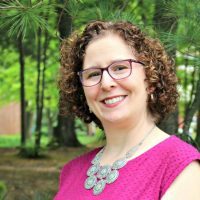 Thanks for supporting MoneywiseMoms at no cost to you! 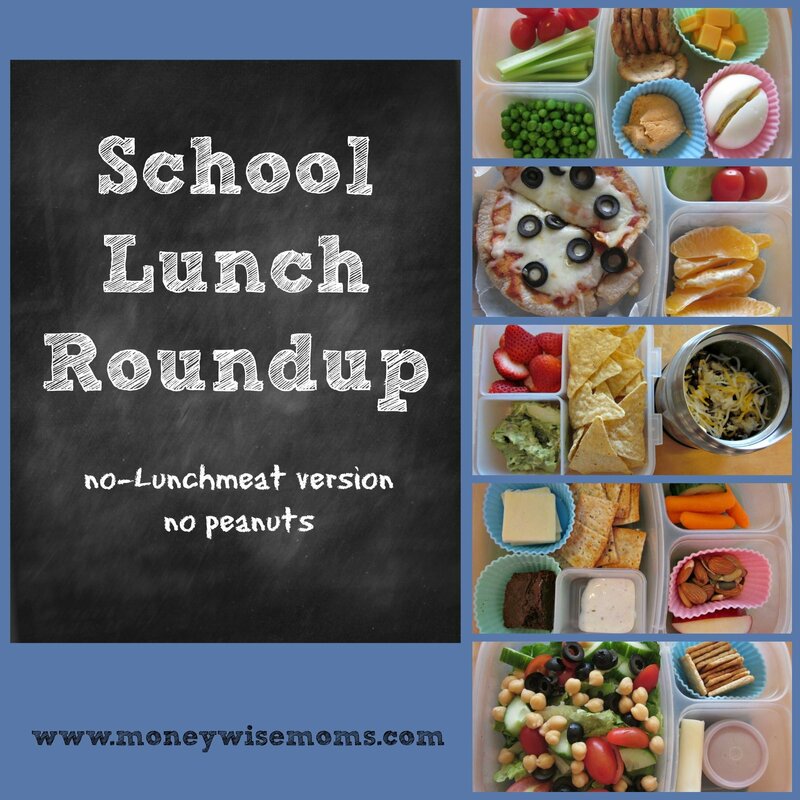 It’s time for a School Lunch Roundup! I mentioned a few weeks ago that I’m trying to get re-inspired on packing school lunches. We still have TWO MORE MONTHS of school left, so I’m looking at another 126 lunches to go. My kids are super tired of sandwiches, and since we can’t have peanut butter (allergies), I’ve come up with some new healthy alternatives to lunch meat. I’m also trying something new–packing lunches while I’m preparing dinner, whether that’s at 8am or 5pm–and it’s working. I feel less rushed as they’re getting ready in the mornings, and since I’m half brain-dead on the mornings I drive my son to 6am swimming, it’s one less task to do. Yay! 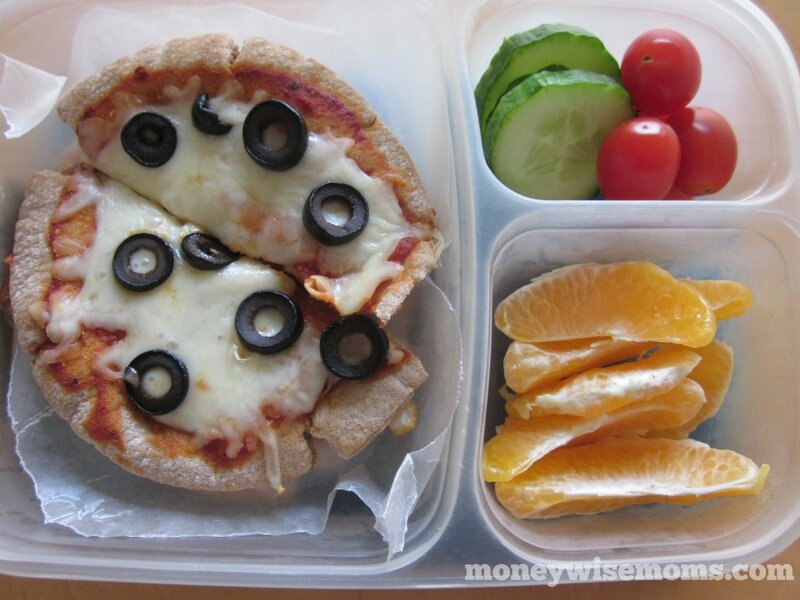 These Whole Wheat Pita Pizzas have been so easy to make and are the clear new favorite by my kids, who would like to have them once a week. I found mini whole wheat pita breads at Trader Joe’s, and while I’m making dinner or doing other kitchen tasks, I make up some Whole Wheat Pita Pizzas using either leftover spaghetti sauce or pizza sauce I make from tomato paste. I put a piece of wax paper in between so the pizzas don’t stick together in our Easy Lunchboxes. Add some fruits & veg, and you have a super healthy real food lunch! I call this the Finger Food Lunch because it reminds me of eating appetizers at a party. 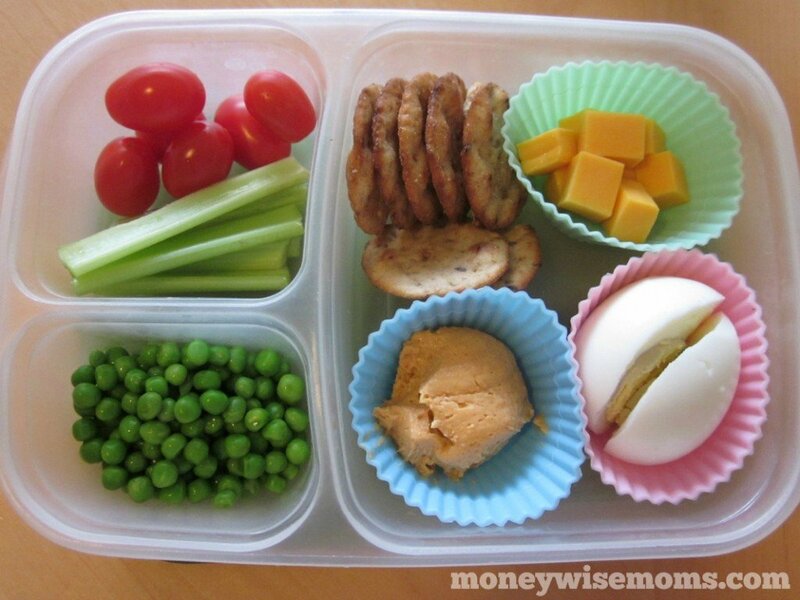 There’s lots of little bits of foods the kids like: celery and tomatoes for dipping in hummus, cheese and multigrain crackers, a hard boiled egg for protein, and some cold peas leftover from dinner the night before. I use Silicone Baking Cups to separate the foods, they’re easy to wash and store and have replaced baggies for us. Beans and Rice is a weekly favorite. I heat up cooked brown rice (leftover from dinner) with black beans, salsa and a sprinkle of cheese in a Thermos Funtainer . This time, I served it with tortilla chips and yummy Greek yogurt guacamole dip I found at Trader Joe’s (they have it at Costco too). Add some strawberries or other favorite fruit in a Lock & Lock Square, and it’s done. This Salad Lunch is easy to prepare while chopping vegetables for dinner. While prepping tacos, I chopped extra lettuce and tomatoes and set up the lunchboxes alongside dinner prep. That makes the mornings smoother! 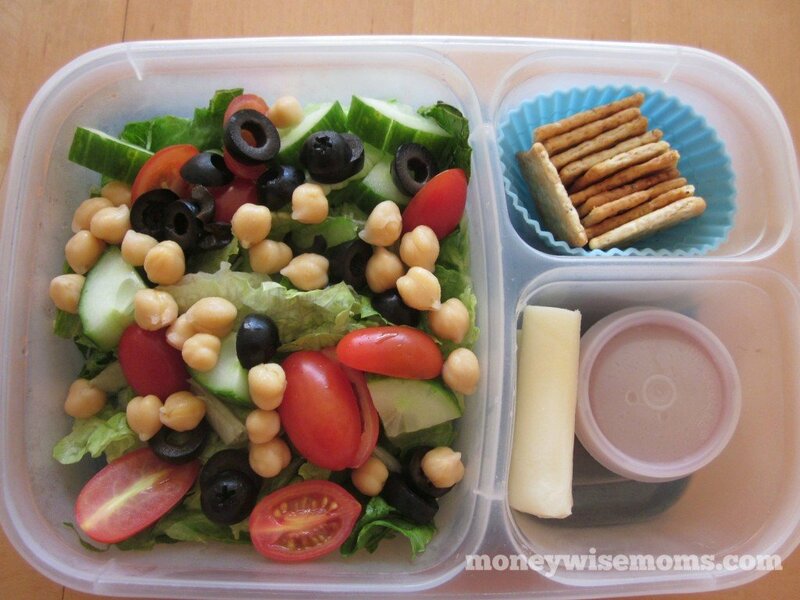 With this salad, I added chickpeas and olives, some dressing in a little spillproof container, a cheese stick and some crackers. To keep it all cold, I use these Fit & Fresh ice packs. They stay frozen well through lunchtime, and my girls have the last lunch of the day. This is another Snacky Lunch. My kids are not terribly picky eaters, but I do have a hard time keeping track of who likes what during any given season. Why do kids suddenly hate a food they’ve happily eaten for five years? By giving them little bits of this and that, they don’t have to suffer through a large serving of something that’s not a favorite. Along with the cheese & crackers, I’ve put carrots and Ranch dip (ugh, not ideal but everything else is healthy), some apple and a whole wheat brownie. We make our own trail mix since we can’t have peanuts in the house. This one has almonds, pumpkin seeds (pepitas), cashews, and dried cranberries. My kids take water in reusable Funtainer Bottle instead of juiceboxes or milk. THese are great. I hate to admit, but our lunches are very mundane. PB&J most days. You’re inspiring me to try some new combinations. 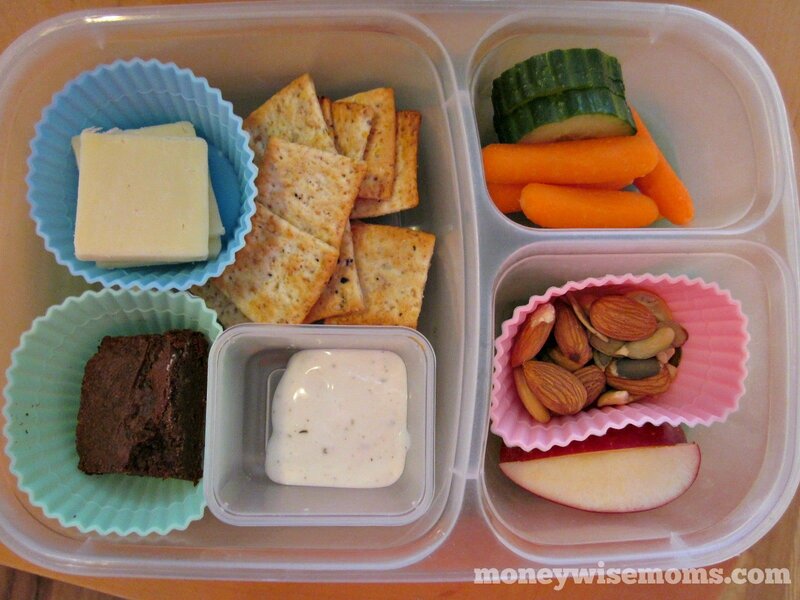 My daughter is not yet in school, but for days when we’re out at the playground, these lunches are such a good idea. Easy to make and healthy. I’ll definitely be trying out the beans/rice idea as it’s my daughter’s favorite meal right now. These look amazing! These would be a great way to get away from Peanut Butter & Jelly. I need to be more creative about lunch. I also need silicone baking cups! They’re the only “bento” type thing I use in lunchboxes. I am so not a cut-food-into-shapes kind of mom. These look great! I pinned them so I can use them for packing lunch on the go.